d i v e r s i t y w o m a n . c o m W i n t e r 2 0 1 7 D I V E R S I T Y W O M A N 43 A healthy, balanced diet, reduces the need for vitamins and supplements. Find out which ones you might still need. One size does not fit all "e reasons why women can't always get all of their nutrition from food are complex," says Daphne Miller, family physician and associate clinical pro- fessor, University of California, San Fran- cisco. "It could have to do with many fac- tors, including health problems such as GI and kidney disorders, limited financial re- sources affecting access to whole, healthy food, and finally, environmental degrada- tion," she says. "It is important to note that much of our food is grown in depleted soil and is therefore lacking in nutrients." Another reason is life stage: postmeno- pausal women might need to add extra calcium and vitamin D for bone health, and pregnant women or women of child- bearing age greatly benefit from extra fo- lic acid and iron. Food allergies, lifestyle choices, simply not eating enough calo- ries, or a medical condition that makes it difficult to absorb vitamins and miner- als well are other reasons an individual might not get the ideal amount of nutri- ents they need from food. When a person falls into such categories, supplementing is highly recommended. By Nor a Isaacs T o supplement or not to supplement? For many years, the advice about whether to add supplements to your diet seemed to change. But today's wisdom is abundantly clear: eating a balanced diet is the best way to pack in the nutrients you need for a healthy body and To Your Health THINKSTOCKPHOTOS mind. Science backs this up. 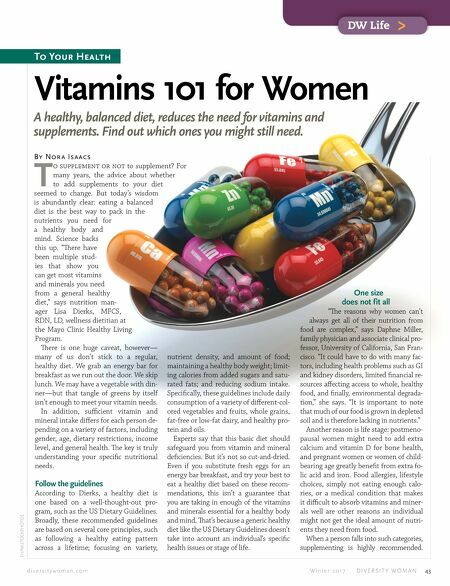 "ere have been multiple stud- ies that show you can get most vitamins and minerals you need from a general healthy diet," says nutrition man- ager Lisa Dierks, MFCS, RDN, LD, wellness dietitian at the Mayo Clinic Healthy Living Program. ere is one huge caveat, however— many of us don't stick to a regular, healthy diet. We grab an energy bar for breakfast as we run out the door. We skip lunch. We may have a vegetable with din- ner—but that tangle of greens by itself isn't enough to meet your vitamin needs. In addition, sufficient vitamin and mineral intake differs for each person de- pending on a variety of factors, including gender, age, dietary restrictions, income level, and general health. e key is truly understanding your specific nutritional needs. Follow the guidelines According to Dierks, a healthy diet is one based on a well-thought-out pro- gram, such as the US Dietary Guidelines. Broadly, these recommended guidelines are based on several core principles, such as following a healthy eating pattern across a lifetime; focusing on variety, DW Life > DW Life > Vitamins 101 for Women nutrient density, and amount of food; maintaining a healthy body weight; limit- ing calories from added sugars and satu- rated fats; and reducing sodium intake. Specifically, these guidelines include daily consumption of a variety of different-col- ored vegetables and fruits, whole grains, fat-free or low-fat dairy, and healthy pro- tein and oils. Experts say that this basic diet should safeguard you from vitamin and mineral deficiencies. But it's not so cut-and-dried. Even if you substitute fresh eggs for an energy bar breakfast, and try your best to eat a healthy diet based on these recom- mendations, this isn't a guarantee that you are taking in enough of the vitamins and minerals essential for a healthy body and mind. at's because a generic healthy diet like the US Dietary Guidelines doesn't take into account an individual's specific health issues or stage of life.